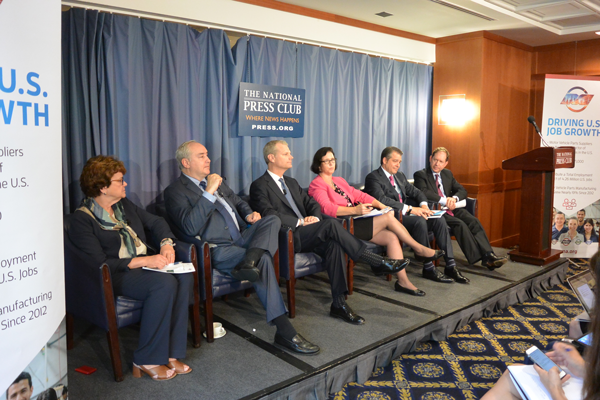 The Motor & Equipment Manufacturers Association (MEMA) hosted a policy panel discussion, “NAFTA and the Automotive Industry: What Will Keep America Competitive?,” on Aug. 9 at the National Press Club in Washington, D.C. Moderated by Bruce Hirsh of Tailwind Global Strategies, former U.S. Trade Representative for Japan, Korea and APEC and former chief international trade counsel for the U.S. Senate Committee on Finance, the panel tackled tough topics related to the North American Free Trade Agreement (NAFTA), such as national security, reshoring jobs, tariffs on imported materials, trade deficits and the value of an integrated supply chain. Attendees included: members of the American, Canadian and Japanese media; associations and corporations within automotive industry; and representatives from government agencies such as the U.S. Trade Representative, U.S. Environmental Protection Agency, U.S. Department of Commerce, U.S. Department of Transportation, National Transportation Safety Board and the Mexican Embassy. MEMA, which represents the largest sector of manufacturing jobs in the U.S., has taken a leadership role as legislators and trade experts explore the potential impacts of renegotiating or modernizing NAFTA and implementing other critical trade rule changes. The event is part of MEMA’s new Policy Breakfast Series, which aims to highlight and explain the complexities of critical issues that affect the motor vehicle supplier industry, such as tax reform, trade policies, workforce development and intellectual property. MEMA Policy Breakfast participants from left to right: Ann Wilson, senior vice president government affairs, MEMA; Charles Uthus, vice president for international policy, American Automotive Policy Council; Eric Farnsworth, vice president, Council of the Americas; Linda Dempsey, vice president, international and economic affairs, National Association of Manufacturers; John Bozzella, president and CEO, Global Automakers; and Bruce Hirsh of Tailwind Global Strategies, former U.S. Trade Representative for Japan, Korea and APEC and former chief international trade counsel for the U.S. Senate Committee on Finance.